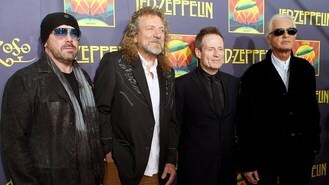 During a news conference on Tuesday promoting their 2007 reunion concert film, Celebration Day, the band became uncomfortable with a question about "anticipating something bigger for the band". "We've been thinking about all sorts of things, and then we can't remember what we were thinking about," singer Robert Plant said testily. He then referred to the reporter as a "schmuck". Throughout the news conference, the band fielded questions about a possible reunion, often responding with stoic silence. At one point, guitarist Jimmy Page mentioned that the reunion concert was five years ago and that if there was a chance they were reuniting, you would have heard. The film covers their 2007 reunion concert at London's 02 Arena. Original members Plant, Page and John Paul Jones, as well as the son of the late John Bonham played a one-time tribute concert in honour of Atlantic records founder Ahmet Ertegun.